When you are shopping around for maintenance products for your vehicle or machinery it can be overwhelming to hear so many names, brands and types of fluids and lubricants. The following is some basic information that can help break it down into two categories of products that you need to know of: engine lubricants and hydraulic fluids. There is a wide variety of oils and fluids in today´s markets. Most of which are necessary and come in different types based on the application for cars, boats, motorcycles and machinery. It can all be a lot to take in. That is why today, we want to further explain what information you need to have before you head out to buy motor oil or hydraulic lubricant. The motor is one of the most important components of any vehicle because it is what powers many of the functions necessary to keep the vehicle running. Since it has many moving parts that are in constant motion it is always necessary to keep it lubricated and protected against friction. 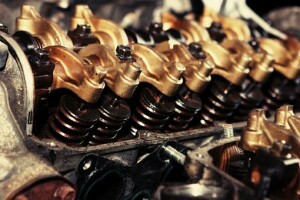 Otherwise, the parts can wear out quickly causing the engine to break down. Motor oil is the fluid that gets this job done. The type of lubricant you use can make all the difference. That is why it is necessary that you use a high-quality lubricant that is formulated to meet the specific needs of your engine. That means you need to look at the engine type (two-stroke, four-stroke, etc.) viscosity (oil grade), additive package, the type of oil (conventional, synthetic blend, full synthetic) and the quality of the product. Use your owner´s manual as a guide on what to look for and what oil grade your engine needs, and when it comes to reliability always use full synthetic oil. AMSOIL carries the best synthetic lubricants that deliver the highest level of performance in any conditions. They are formulated to coat and protect the engine against rust, heat, and friction at all times. They carry different synthetic lubricants for every kind of engine and application. Whether you need lubrication for motor machinery, a gasoline car, diesel vehicle, a watercraft or motorcycle you can find it at all at Mooresville Synthetic Oil. Contact them right now for assistance in selecting and obtaining the lubricant or product that your engine requires. A hydraulic system is any system that requires a force activation from one point to another. These systems can be found in machinery or vehicles. Some examples of hydraulic systems in a vehicle include the brakes, clutch, and power-steering system. Hydraulic fluids encompass a line of different flowing forms of lubricants each designed for a different part of your vehicle or machinery. Basically hydraulic fluid is the base fluid that is used in the different area of your vehicle that uses the force of the actual non-compressing fluid to create both a flow of force and protection. That is why the brake fluid, clutch fluid, and power-steering fluid, are all forms of specialized hydraulic oil. However, hydraulic fluid, as is, and under that name, tends to be used in machinery and other hydraulic systems of industrial application. For example, AMSOIL´s Synthetic Multi-Viscosity Hydraulic Oil - ISO 22 is a synthetic hydraulic oil that delivers complete protection and reliable operation in all hydraulic applications, especially those of industrial equipment. To learn more about some of the hydraulic power problem´s and solutions, click here. When selecting a hydraulic oil you need to take into consideration its use. There is hydraulic oil for different types of machinery and even for different systems inside your vehicle. That is why the primary thing you need to know is what viscosity grade you require and the hydraulic type that you need. Depending on the hydraulic pump of the system, the operating temperature, and pressure, the hydraulic oil may need to have more enhanced properties. Verify with your owner´s manual and double check with an expert so they recommend the right product. AMSOIL carries several hydraulic oils for all kinds of machinery and use. Each created with the different requirements necessary to cover the needs of each hydraulic system specifications. Whether it be motor oil or a hydraulic fluid that you need, always purchase the most reliable products. AMSOIL has an extensive variety of outstanding oils for all applications. Call Mooresville Synthetic Oil today at (336) 247-0212 and get a hold of the products you need and the quality you want.